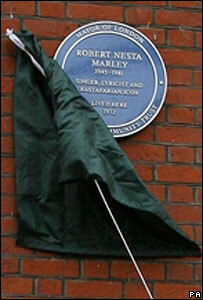 Reggae legend Bob Marley has been honoured with a heritage plaque at his former north London home. The plaque, the first to be endorsed by the mayor, was unveiled at 34 Ridgmount Gardens in Camden on Thursday. Jamaican-born, Robert Nestor Marley remains a top-selling reggae artist but died from cancer, aged 36, in 1981. The event is part of Black History Month, a season of events promoting the contribution of African-Caribbean communities in London. Marley's widow Rita said: "My husband's music is loved all around the world, although he had a special affinity with London. "The family is pleased that he is being honoured with a commemorative plaque in London and we truly look forward to seeing it the next time we are in London. Jah bless you all. One love." Marley lived at Ridgmount Gardens in 1972 when he first came to England, just as his group the Wailers were making a name for themselves. The plaque has been organised by the Nubian Jak Community Trust in partnership with the Mayor of London, Ken Livingstone. 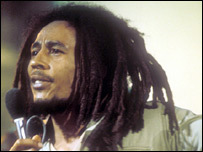 Mr Livingstone said: "Like many people, I have appreciated and admired the work of Bob Marley for decades. "He was quite simply a musical genius, and he remains a much loved international, iconic reggae artist. Sharon Saunders, acting Jamaican High Commissioner, said it was a proud day for the Caribbean nation. "I'm particularly proud as a Jamaican to see Bob visibly represented on a building here in London." Marley, who was behind songs such as Get Up Stand Up and One Love, was presented with Jamaica's Order of Merit a month before his death in Miami. This week he was listed as one of the world's top-earning dead celebrities, by US business website Forbes.